Come out to the Good Nature Broad Street Tap Room to enjoy 1911 Ciders! We’ll have their Original, Raspberry, and new specialty Hopped Cider, and will be mixing them with various Good Nature brews or NYS spirits! RSVP to the Facebook Event & Invite Your Friends! Join Colgate for a discussion around sustainability, entrepreneurship, and the local food and beverage movement. The panel will cover topics such as water and energy issues, sourcing ingredients, and the intersection of community and corporate sustainability with business decisions. Rotation Nation III Beer Release – Cans & Draft! While Good Nature Brewing has been around since 2011, we’re still growing and developing—first at the old brewery on Milford Street, then about 5 years ago we opened our Broad Street Tap Room, and now in our new(-ish) Farm Brewery digs with increased brewing capacity, a packaging line, a farm-to-table kitchen, and Beer Garden! 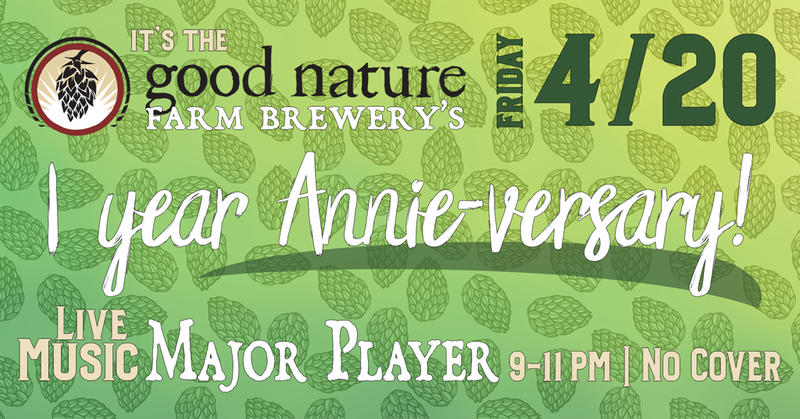 Come celebrate another milestone in Good Nature’s history with us.